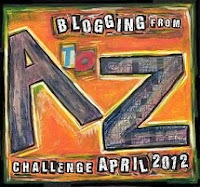 Because I think it's an interesting challenge and I like the idea of bouncing around to check out some blogs I wouldn't otherwise see, I am planning on participating in the A to Z blog challenge in April. You can click the logo to read more about it. Here's my problem... My understanding is that I'm supposed to pick a topic and post on twenty-six items from that topic - one for each letter of the alphabet. I've tossed around a few ideas, but I'm just not sure what to write. What would you like to read about in April? My first thought is that you could relate it to your word for the year, healthy. You could also do something like "life lessons" from your kids, your writing, etc. That's a good idea. I really like the life lessons from kids one... so much there.